Born in 1935 Tubby Hayes was playing professionally at the age of fifteen, four years after he started playing the saxophone. A virtuoso musician he eventually played tenor, soprano, alto and baritone saxes, vibraphone, piano, flute and percussion as well as becoming a fine composer and arranger. He went on to form the "Jazz Couriers" with Ronnie Scott, probably the most successful of British modern jazz groups. The Jazz Couriers were a quintet built upon the now classic format of two tenor saxophones and a rhythm section, and also upon the new wave of hard bop emerging from the United States. In 1957 Tubby had taken up the vibes after Vic Feldman had bequeathed his instrument to him before his return to the United States. Less than six months later Tubby was recording on them and sounding for all the world like Milt Jackson (on Reunion from the Jazz Couriers first LP). Then, in 1959 he took up the flute, and was playing the instrument on a gig within days. He also played baritone sax, his baritone work was well showcased on Jimmy Deuchar's Pal Jimmy CD. Tubby used the Couriers to develop his composing and arranging ambitions. It says a lot for Hayes' abilities as a tunesmith that his arrangements for the Couriers of standards such as Cheek to Cheek, although the most popular items in the band's book, never overshadow his own compositions. The Couriers existed from 1957 to 1959 and would probably have continued for longer, but Scott and Hayes both wanted to do other things and the band folded. Following the break-up of The Couriers Hayes reverted to the quartet format and the albums Tubby's Groove, Tubbs and Palladium Jazz Date, reveal that his talents had matured into a style that cleverley brought together the best of the musicians he admired such as Stan Getz, Sonny Stitt, Hank Mobley, Johnny Griffin and Sonny Rollins. Hayes was at his peak in the early 1960s, and it was during this time that he enjoyed some of his greatest triumphs; in 1961 he became the first visiting English jazz soloist to play a residency at the 'Half Note' club in New York attracting audiences that included Miles Davis. He also visited Boston and Los Angeles as well as recording in America with trumpeter Clark Terry. In London he led his own big band for which he did most of the writing, and had his own TV series 1961 to 1962 and 1963. He consistently won musical awards often in several categories including Best Tenor Saxophonist, Best Small Band and Jazzman of the Year. By the early 1960s he was the best known jazz musician that England had produced and through the 1960s he appeared in films, played the major festivals and had his own recording sessions in New York. Tubby established his own big band on a semi-regular basis from 1961. Away from the small band format of hard bop, his big band featured a superb swinging sound. The albums made by the big band were Tubbs from 1961, Tubbs Tours, from 1964 and then in 1966 what was probably his finest big band recording, 100% Proof an album of bebop themes. From 1962 to 1964 Tubby Hayes' led a group featuring the Scots trumpeter Jimmy Deuchar and the live albums the group recorded at Ronnie Scott's club in 1962, Late Spot at Scott's and Down in the Village are from a time when Hayes reigned supreme. Other later releases such as Tribute to Tubbs and Night and Day, from similar live sessions are available. With the quintet Tubby extended his virtuosity on the vibes to exquisitely chorded four part harmony renditions of songs such as But Beautiful, and although Tubby could have easily have based his reputation on vibes alone, he abandoned the instrument in 1966. Late in 1965 Tubby's health began to deteriorate and he collapsed through sheer exhaustion brought on by overwork. There were further health problems in the following year. Tubby had always drunk heavily but he was now dependent on narcotic drugs. He had become frustrated with his colleagues and the music he was playing and in the summer of 1966 he formed a new quartet, using young jazzmen more in tune with the new ideas coming into vogue - pianist Mike Pyne, bassist Ron Mathewson and drummer Tony Levin. The band worked into 1967 (live sessions can be heard on the CDs For Members Only and Tete a Tete) and then came what many regard as Tubby Hayes' finest album, Mexican Green. It was released in early 1968 to critical acclaim everywhere, but it came at a time when Hayes' personal life was in tatters. Already a sick man, he ignored warnings to slow down and ravaged by drugs and drink, and disgusted with his playing, he turned reclusive and spoke to no one for nearly three months. He was sorting himself out when he was arrested and charged with narcotics offences. In 1969 he formed a new quartet with guitarist Louis Stewart and drummer Spike Wells. He had a new interest in free jazz and rock music and dabbled with the format working from time to time with Georgie Fame as well as his now settled quartet format including the Mike Pyne and Ron Mathewson rhythm team.An excellent Live 1969 CD, captures one of Tubby's final gigs with this quartet. But by early 1970 health problems resurfaced when doctors discovered he had a faulty heart valve. He underwent an operation a year later and was out of action for the whole of 1971. When Tubby made his comeback in early 1972, the jazz scene had changed. The avant-garde had wreaked havoc and jazz rock had ravaged the music. Tubby's rejected the changes and his reaction was to go out and do straight-ahead gigs with his reformed quartet, playing much the same repertoire as he had done a decade earlier. He began his comeback with an overseas tour, making a successful trip to Scandinavia in February 1972. This tour is commemorated on the Storyville CD Quartet In Scandinavia. Although now in poor health he worked on until another collapse before what transpired to be his final public appearance in Brighton in May 1973. Doctors confirmed that the replacement heart valve was failing and that a second operation was necessary. His death from complications undergoing surgery on June 8th, 1973, aged just thirty- eight. was a major loss to the jazz world, not just in the UK. Tubby Hayes made an incredible number of recordings and most of his important work is currently available on CD. he recorded many programmes for the BBC and a few titles have been issued on the IAJRC (International Association of Jazz Record Collectors) CD - Tubby Hayes: England's Late Jazz Great. 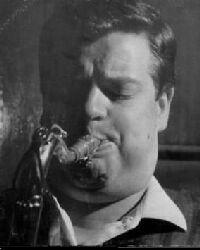 Dave Gelly wrote that Tubby played Cockney tenor-garrulous, pugnacious, never at a loss for a word and completely unstoppable. Allan Ganley, drummer in Hayes' 1962-64 quintet remarked that Tubby made you play. And you always wanted to give your best because it was him. Nobody worked harder than Tubby, his friend and fellow saxophonist Bobby Wellins remembers. This page was last updated during August, 2008.